Really sad that the ski season, is coming to a rapid close. We’ve enjoyed some lovely skiing, but not enough for my liking this year… and am already considering ‘bigger’ plans for next season! Can’t wait! – Looking forward to expand my ski repertoire, somewhat so hopefully if all goes to plan a new venture may be in the offing! I was quite desperate to get out on the snow yesterday, and we finally decided to venture up to La Balme, as there was at least a 35% chance of some sunshine, after a light overnight snow dusting. The closer we got, the greyer it was, no problem parking! wonder why?! And we were also offered a couple of passes, for next to nothing from some people who were trying to sell theirs! Deciding, that we’d come this far, we decided to go up anyway, and at least give our skis an all but final run, for the season, and this is what we were greeted with! Really very depressing… the conditions were as you can see or not! It was ok-ish, but we only managed one run down in the miserable but ‘laughable’ conditions, which was enough! Bit pathetic really, but it was just bof! Too Much, of a Windy Thing! Local Pilot.. off and straight up! Lovely sunshine this morning, although there was just one big problem…. the wind! There were a couple of brave souls taking advantage of the air. Dennis had a fly down to landing, to assess the conditions for our students, unfortunately, it was just too windy, and unruly for them to fly in. We waited for a while, and watched some other pilots take off, and get pinned. Ok, if you have active flying experience, but not so good for the novice. The wind increased and later in the day, I took Tizzy walking, and noticed a handful of gliders trying to lose height in the valley. Turns out they were, the ‘joint services’ out here for the weekend. Going up, wasn’t the problem! So the summer is slowly winding in, as there was a distinct feel of Autumn in the air today, showing a very slight hint of tree tip colour change. 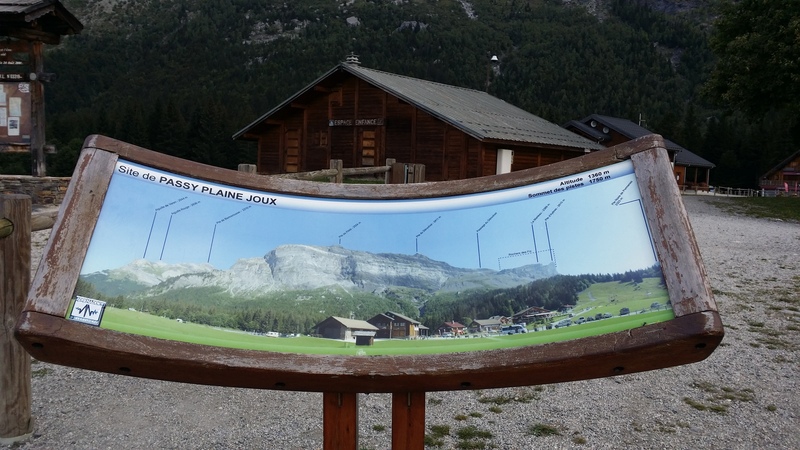 The flying amazingly has been really lovely… smooth air with thermic activity not disappointing at all! 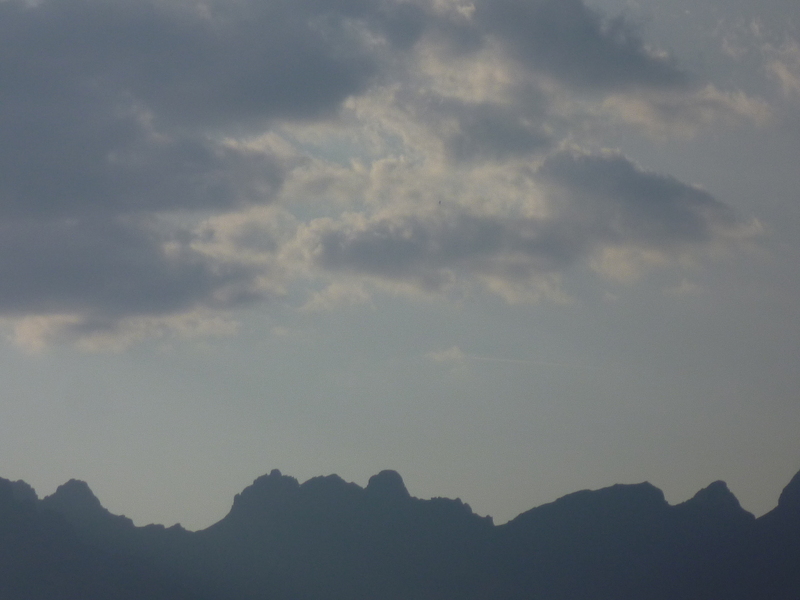 In fact the thermals have been accommodatingly serene, still taking us up to heights easily climb-out-able. 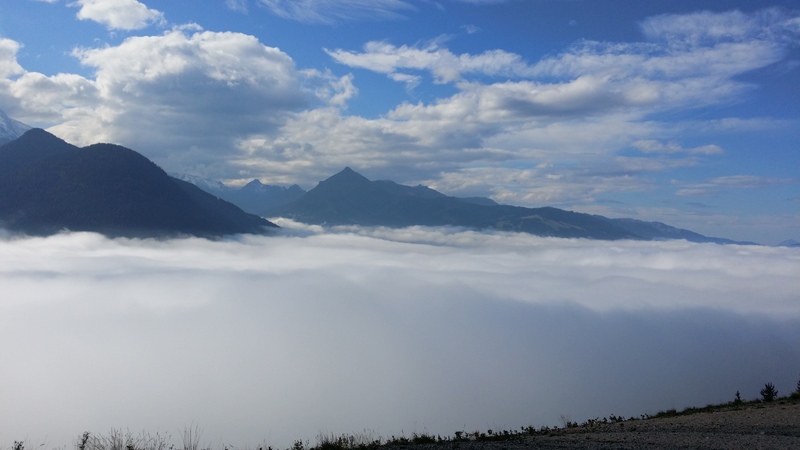 Just a taste of what can be found during the autumn and winter months in the alps! Sometimes, the lapse rates work out so well, that it’s still possible to nuzzle out the unexpected cross-country! This week we have two new fledglings, who are doing really well, and are already part way through their EPC training. Flying this morning was excellent, as we had the whole launch area all to ourselves! We did have a bit of a wait, before first launch though, as we had heavy cloud blocking the sun, so the katabatic airflow hung around for a while before we could launch. Whilst waiting for the right moment.. 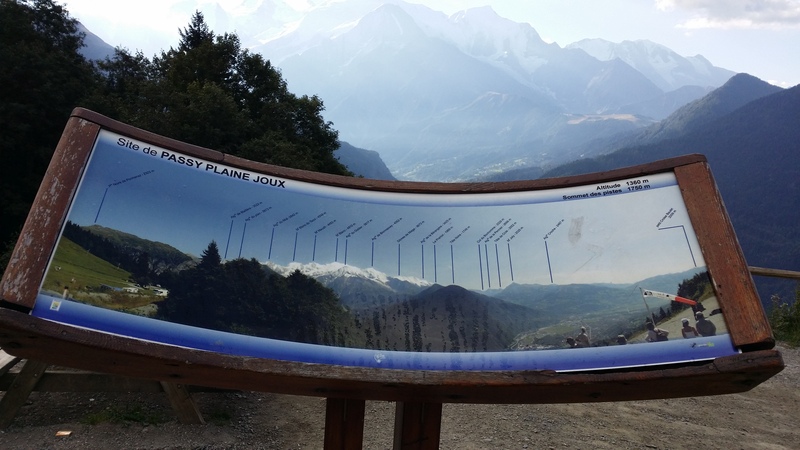 I thought I’d take a couple of shots of the Plaine Joux info/tourist information boards that are here for all to see… includes the names of the mountains with altitudes. Please click the images to expand for further detail. 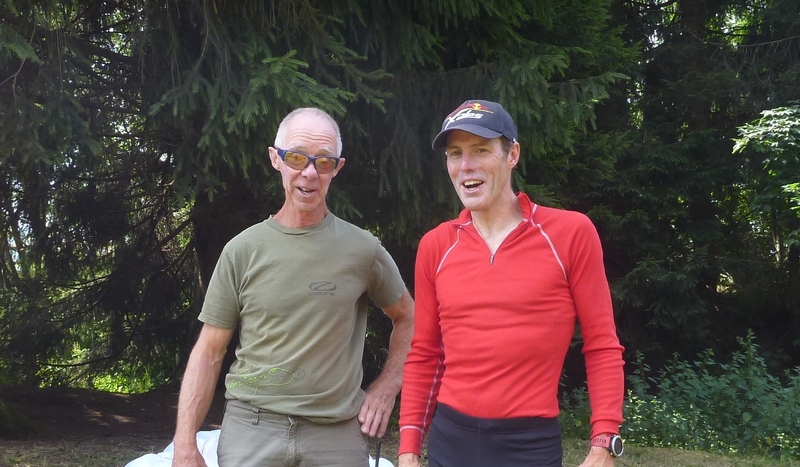 Dennis and Steve, meeting up in the very place where Steve had his very first mountain flights! Yesterday, we had the pleasure of catching up with team GBR on their flight over from Chamonix, as they landed here at Plaine Joux. It was great to catch up with both Steve Nash, and Richard Bungay, en route to Monaco. Couldn’t believe how amazingly ‘light’ and ‘flimsy’ Steve’s harness was! there was barely nothing to it!!! They both were taking shade under the trees to the side of launch here, waiting for the thermals to kick off, which is usually around 1pm, which they were both fully aware of… taking off earlier would have made it much more difficult to climb out, although both a GTO, took off and managed to scrape out, Dennis took off, and did quite well, and I took off, maintained for a while ended up with my helmet varios’ sticky coming undone, (because of the heat!) so the thing was dangling about causing me unwanted distraction, so although I managed to squeak a climb, went to land, where Shirley was waiting with Sparky, and the Nova, X-Alps support vehicle. 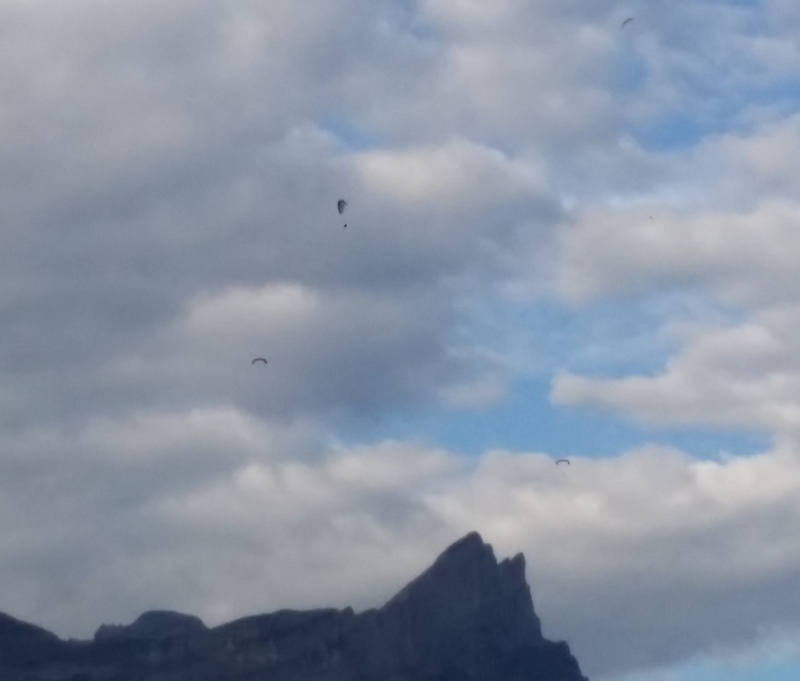 It was nice to have some friendly banter, whilst waiting and watching both Steve and Richard, take off and scrape around Varan launch area, before climbing out and heading off over to the Aravis, and on to Turnpoint 9, at Annecy. 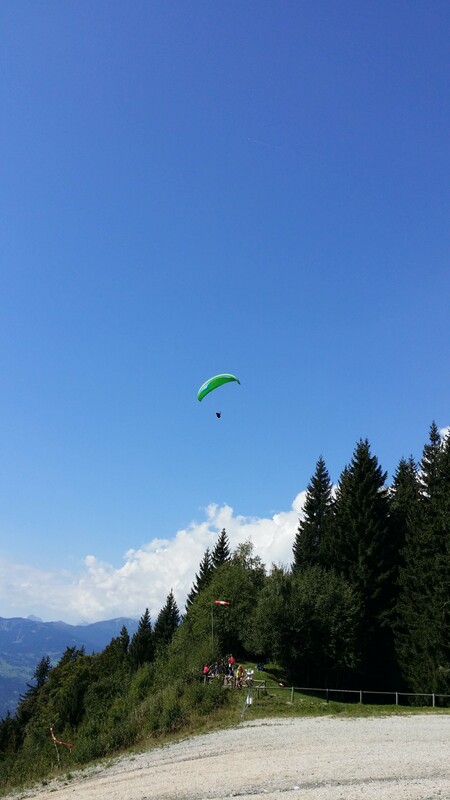 That was yesterday, and Steve had a great flight and made it to Annecy which was his intention, but he did then manage to exceed that goal, and continue on further along the course. 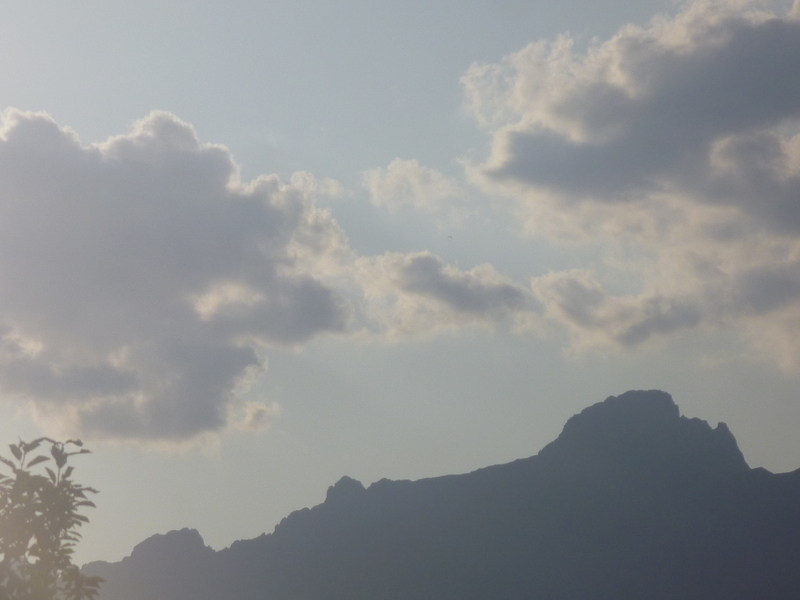 Unfortunately, we missed Guschlbauer, as we were not able to watch the ‘Live Tracking’ at launch… he would have flown right above us… shame… Great that he is in hot pursuit of Maurer though, I think this is the closest running X-Alps ever! 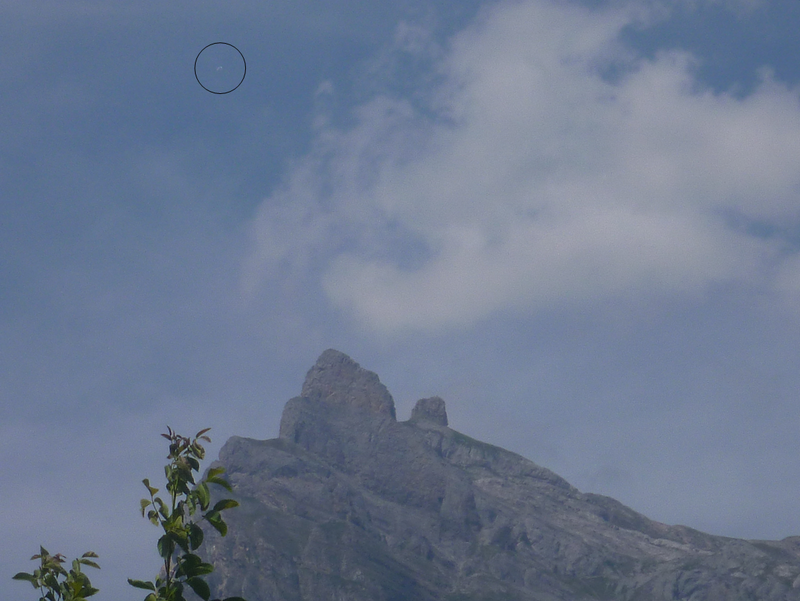 Watching the X-Alps live tracking, I was waiting to catch a glimpse of Maurer as he flew towards the Aravis… it was fantastic! Simply knowing what has been happening over the last week, and catching a glimpse of the action was just incredible. 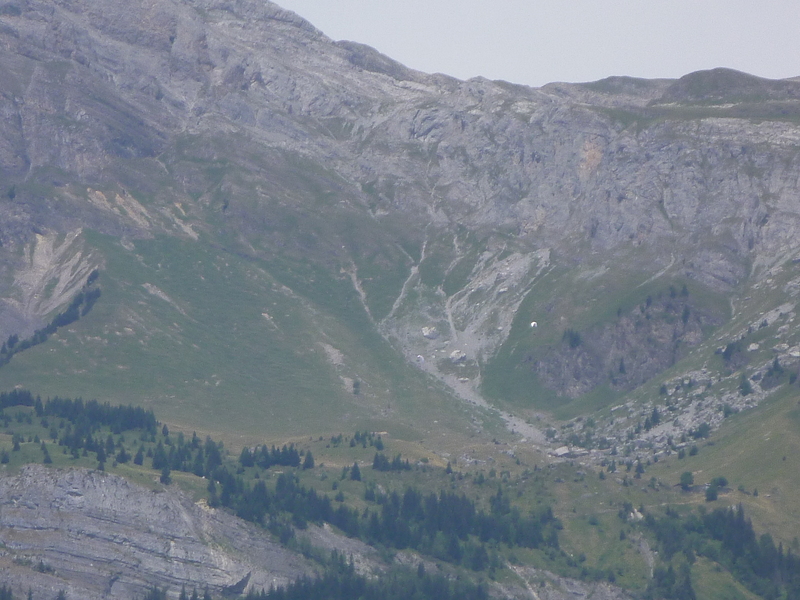 Spot Chrigel en route to the Aravis..